Let’s Start Taking Back Our Country! - Charley Brady - Opinons; My Own. Let’s Start Taking Back Our Country! This Weekend…Let’s Start Taking Back Our Country! Listen up if you please, friends and occasional readers. I haven’t been posting on this site half often enough, due to time constraints as much as anything. But I know that there are people out there who occasionally tune in to see what I’m up to and in particular there are quite a few of you from the Galway area. So I’ll say this to you with hand on heart: I believe it is in your interest to be at the Fountain on Eyre Square at two o’clock this coming Saturday, November the 1st. If you never take heed of a single thing that I say on this site, please give some thought to this. It wasn’t supposed to go this way for them, you see. 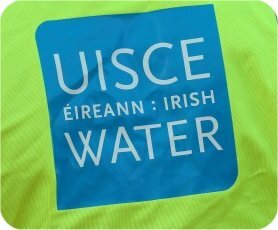 You were supposed to just sign those Irish Water consent forms, give them all your details and lie back and take it…just like you always do. Something went wrong this time, though. I don’t know if it was Phil Hogan’s loathsome face or the idea that those who were voted in by us because of false promises, turned around and betrayed us. They didn’t just betray us by slapping another vile, immoral tax on us in the form of water that we already pay for. No, they betrayed their own constituents by selling the idea abroad that we are an ungrateful shower who won’t pay for something that everybody else does. They betrayed us by making others think that we don’t already pay through the nose. And because our political masters– who only have the care of their own in their minds– were aided and abetted by a docile media and a national broadcaster that is little more than a propaganda station, they almost got away with it. But as I say, for some reason this proved one kick in the guts for the electorate too many. Make no mistake about it: they are on the run. 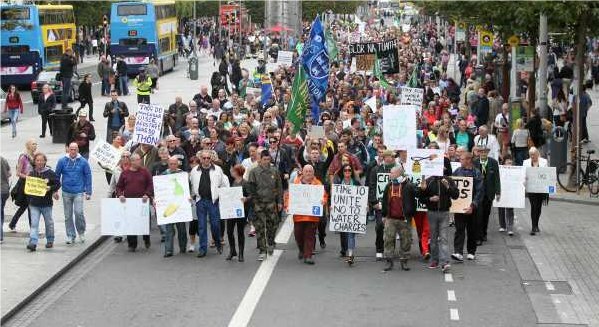 They have been on the run since 100,000 people marched peacefully through Dublin in a display of disgust at those who were hiding behind the walls of Leinster House. And hiding they were. Hiding and plotting damage limitation. Because it wasn’t meant to go this way. Now we have two-faced scum of TDs and Senators who are back- peddling like crazy people; we have elected representatives who were in complete support of gouging more money from a strapped, austerity-maddened, browbeaten population—only now they are panicking and acting as if they were on our side all along! Like hell you were, chancers; like Hell you were. And I for one will be remembering every single one of you lying swine. I know that some of you out there have never gone to a march in your lives; I know that some of you don’t think that it’s quite seemly. Listen, I can sympathise. But I tell you sincerely: if you stay at home this weekend and hope that others will clear things up for you, you will find it a huge well of regret in years to come. Because if we don’t keep after them now that the threats have kicked in, in force; and now that the promises of lighter sanctions are being bandied about…let me tell you, if you don’t just ignore that and say: Not one damned inch will I budge, then you will never get another chance. They will know that they can threaten you with things that they cannot do and you will be frightened by them into believing that they can. And how on earth did we ever let it reach a stage where we allow ourselves to be frightened by those who are supposed to be working in our employ! I hope to see you clogging the streets this coming weekend. This is our time now. We’ve been listening to a corrupt, rotten-to-the-core government of liars and thieves for too many years, telling us that they have a hard job to do whilst drinking and dining and first-class travelling off our broken backs. Well, we have a hard job to do also; and it’s called Taking Back Our Country. Let’s start doing just that this weekend. Oh my, I just deja vued to 1968, one more time – POWER TO THE PEOPLE! Excuse me, Johnson, Viet Nam and all that – what a rush! But we did it then, the marches and political actavism forever changed the good old USA and it will work in Ireland too if you can keep the preasure on and people involved in THEIR government. You said it there: it is OUR Government. We’re the ones who allowed them to forget that they work for us. It was never supposed to be a case of: “Vote us in and we’ll ignore anything we promised to do”. So we have to shoulder the blame for listening to liars in the first place. Do you think that I’m looking forward to hitting the streets at this stage in my existence? I’m not doing this because I want to do it. I’m doing it because I have to do it. These gougers have to know that they can’t just decree something from their ivory towers and expect the clowns who pay their wages to let them get away with cheating and lying for another few years. They have rubbed our noses in it time after time, because as ex-Minister for Health Mary Harney quite accurately said: the electorate have short memories. Well, you know what: you politicians have taught us that we have to have elephant-like memories. We have to remember every lie you ever uttered and we have to hold you to account for those lies. Kermit, we WILL start on the road to taking back Ireland from those who in any other age would be considered traitors. By God, we had better; because if we let this one go through we had also better be prepared to lie down and bite the pillow for the rest of what will be a pretty miserable existence. For myself, I can only repeat what I said in a previous article: not one more cent from me do they get. I’ll NEVER weaken on that–and in the faint chance that I did, all I will have to do is think about the disgusting, smug,ignorant face of Phil Hogan as the incompetent buffoon lords his way around Europe.